» My Pillow Review: Is it really the most comfortable pillow? My Pillow Review: Is it really the most comfortable pillow? Do you have trouble getting comfortable and falling asleep? Do you wake up numerous times during the night? Do you wake up in the morning with a sore neck? If you answered yes to any of these questions, you need to take a second look at your pillow. After all, having the “right” pillow is critical to getting a good night’s sleep. After trying hundreds of different pillows and struggling to get comfortable, sleep eight hours, and wake up pain free, I finally found it, and this is My Pillow review. My Pillow has been endorsed by the National Sleep Foundation; this must count for something, right? The manufacturer offers a 60-day money back guarantee. I had never seen this with any other pillow on the market. My Pillow comes with a ten-year warranty. I have never had a pillow last two years, let along ten! My Pillow is machine washable. I would hate to count the number of pillows I have thrown out because they were dirty, and I had no way to wash them. Also, because they are washable, they help with allergies. After discovering all of this, I decided that I needed to give My Pillow an honest try. After a few weeks, I felt like a new person. I was sleeping through the night, and I wasn’t waking up with a neck ache. Getting eight hours of sleep literally changed my life. I have had more energy and more “zest” for life. Needless to say, David is thrilled! Since that initial purchase, we have purchased several more My Pillows. They have made the perfect gifts for our parents and adult children, and we bought the travel pillow and the “roll and go” pillow. From what I have read, all of these pillows are made from an interlocking fill that simply won’t go flat. I can attest to that. You can literally “shape” the pillow to fit your head and neck perfectly. A bonus was that David’s snoring has become almost nonexistent since he starting using My Pillow; who wouldn’t want that. 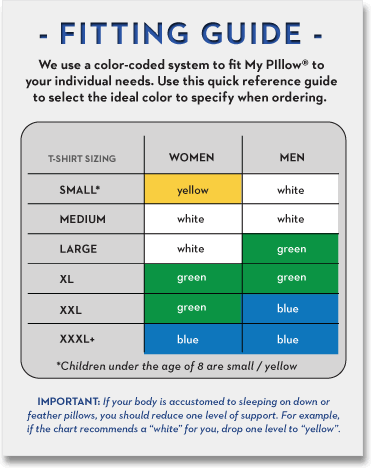 If you order My Pillow, be sure to use the Fitting Guide so you purchase the right level of support and the right size according to your weight and shoulder width. Now, if you are concerned about the price, don’t be. My Pillow is worth every penny. My Pillow actually has extra material on the sides (side panels) that adds to the strength of the pillow as well as allows for more expansion. All in all, the price is very fair. 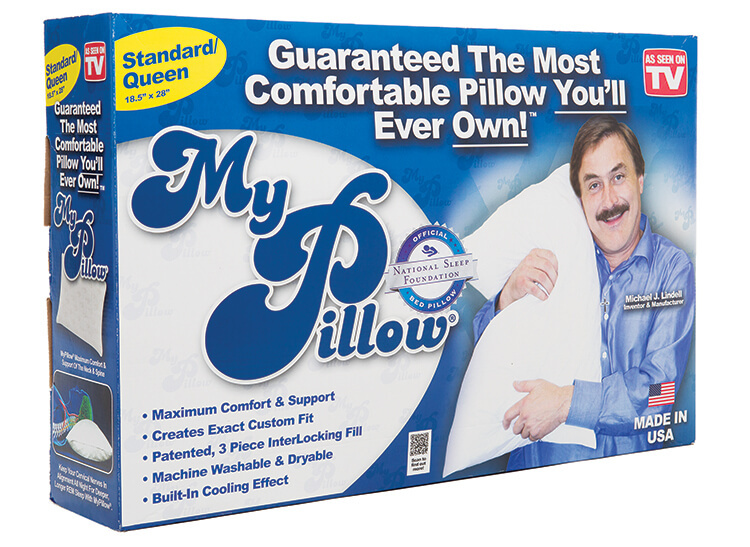 So, if you are ready to sleep all night, wake up feeling rested, and wake up without a sore neck, think about buying My Pillow. I hope you have enjoyed My Pillow review in addition to learning about My Pillow. Now, go out and try one for yourself! I would highly suggest buying the pillow cases for your My Pillow. These pillow cases are 100% cotton and are so soft and comfortable. In addition, they keep My Pillow cool, another added bonus. If you find that you can’t be without My Pillow, you can do what we did - order the travel pillow. It rolls up into a little bag, so it’s easy to transport. We use it in our camper, at hotels, and when we travel to see our kids. It’s even compact enough to fit in your suitcase when flying! You can also buy the 100% cotton pillow case for this travel pillow and, remember, these pillow cases are not only comfortable but they also allow your pillow to stay cool. My husband loves the My Pillow Neck and Cervical Bolster too. It works perfectly under his knees to help ease his back pain. He also uses it in the tractor behind his back for additional lumbar support. You may want to consider this if you have back pain.